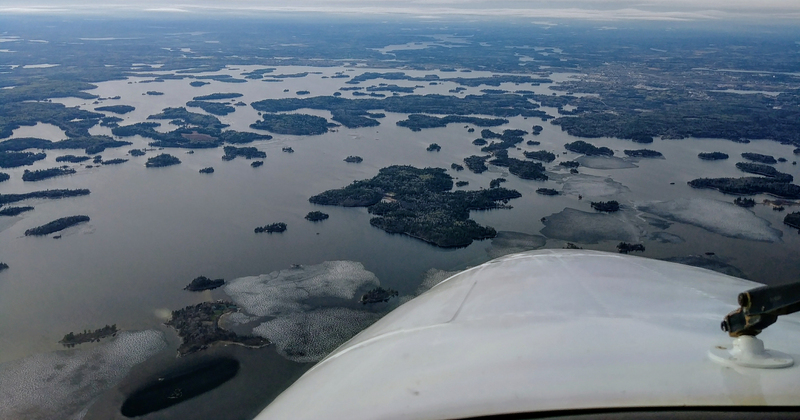 I went flying today, and saw no ice on Lake of the Woods. You can click on this picture to view a larger version and zoom in to see for yourself. In this photo, the nose of the King Air is aimed at Middle Island, with Hay Island to the left, Scotty Island just right of center, and Whiskey Island at the extreme right. The full span of the Barrier Islands is visible in the middle distance, and there’s no sign of the ice that was holding out in that area. Yesterday’s satellite images were blurred, but some ice was visible. Today’s had some cloud cover, but by comparing two images, I was able to see pretty much the whole lake, and there was no visible ice, so I think even the ice down by Baudette is gone. So I’m calling it. As of today, Lake of the Woods is ice free. The brick graph gets a magenta block for 2018 to celebrate. This spring was one of the four latest springs of the sixteen on the graph; behind the curve, but not outrageously so. To show the timing of the onset and conclusion of the thaw, here’s the finalized version of the floating bar graph. Each year’s bar starts on the Inflection Date (when the daily mean temperature rose above freezing) and ends on the date when the lake was ice free. Depending on your monitor size and settings, you might want to zoom in on this to read the numbers. In summary, it shows that compared to other recent years, the 2018 thaw got off to a late start and then went fairly fast. Shoal Lake, west of Kenora, still has a large patch of ice. Trout Lake, east of Red Lake, still has extensive ice. 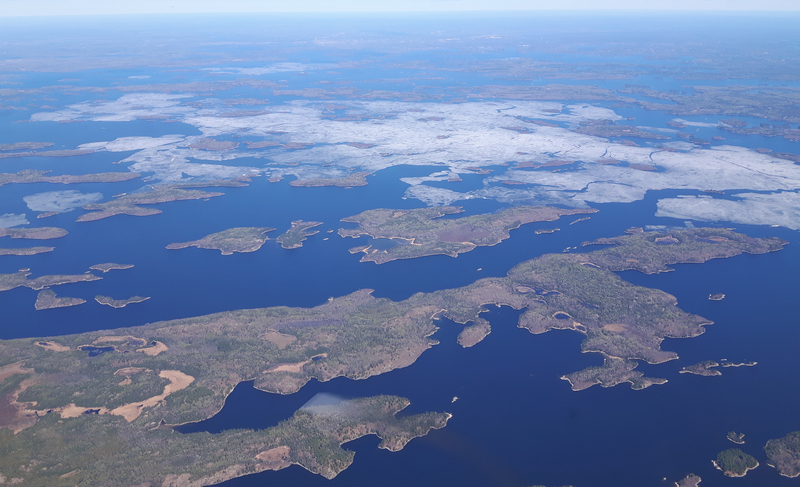 Lac Seoul, near Sioux Lookout, still has some ice near Kejick Bay. I’ll be wrapping up the Ice Patrol for the season in the next few days. Thanks to everyone who visited this year- I had record traffic! Special thanks to all who contributed with photos, comments or emails. I couldn’t have done it without the help of my co-workers at MAG Canada. 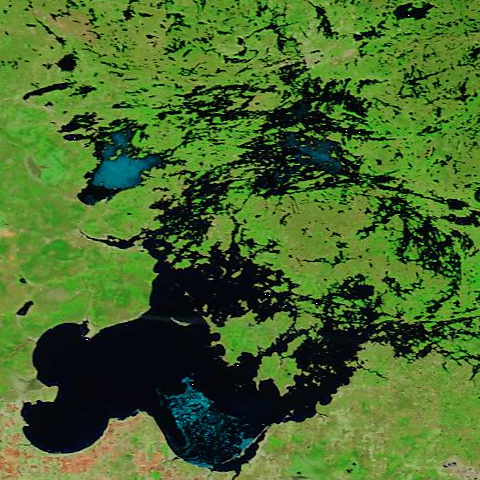 Terra Satellite captured a clean image of Lake of the Woods today. Here’s how it looks in True Colour. You can see there are three main patches of ice remaining. 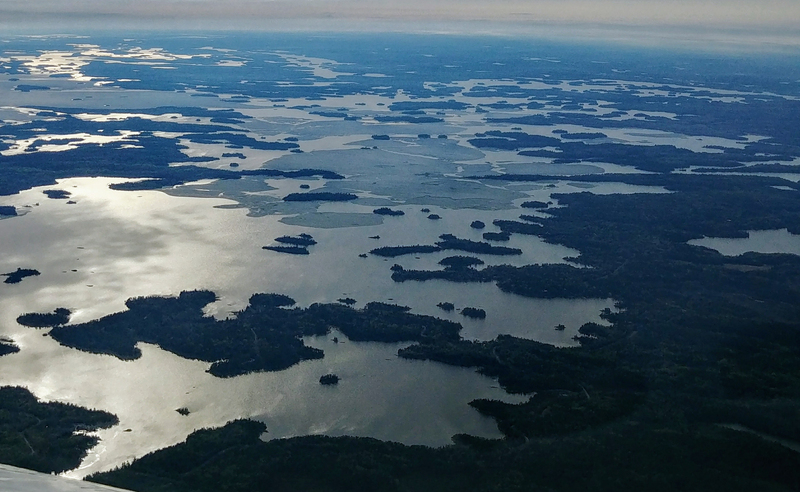 The bright one at the left is Shoal Lake, and the fainter one to the right of it is the area south of the Barrier Islands. The patchy one near the bottom is by Baudette. Side note: Kenora shows very clearly on this picture as a beige blotch at the upper right. Look closely, and you can just make out three tiny dark blobs in the brightest part. Those are Rabbit Lake, Round Lake and Laurenson’s Lake! Here’s the same image in false colour. Now that you know where to look, you should be able to spot our suburban lakes again. The same three patches of ice are visible, but the differences in ice strength more clear. Sometimes, very thin ice is indistinguishable from space. So I went flying and took a look from the air. Click on any of the pictures below to see a larger version that you can zoom in on. Middle Island and the Hades are in front of the aircraft’s nose. Scotty Island is in the center of the frame, and the patch of ice extending from Scotty to Whiskey Island is not visible from space. It is very weak, and will be gone tonight. The larger sheet of ice is the one south of the Barrier Islands. It’s in poor shape, but it’s pretty big. We circled around it for a closer look. This picture looks north, with Cliff Island in the foreground, and Bath Island dead center. The Barrier Islands are at the far edge of the ice, and the little patch by Scotty can be seen beyond them. Kenora is just visible as some pale specks in the far-off haze. You can’t see all of this icy area in this picture; smaller sheets of ice extend in both directions, but they’re weak and won’t last. Our training flight took us over by Sioux Narrows. Click on the image to zoom in and see the iconic bridge in the foreground. Beyond it is Whitefish Bay, which has a reputation for thick ice, but it’s no straggler this year: it’s all open. The black and grey blur is just a propeller blade photo-bombing the picture. 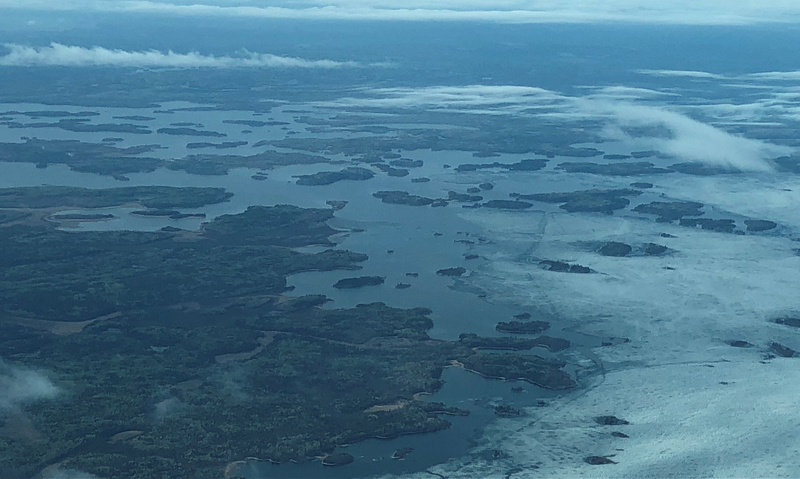 This picture looks west, so in the top right corner, you can see the ice we circled around before, and far off on the horizon, the white line is the ice on Shoal Lake. We didn’t go far south, so I didn’t get a good picture of the ice down on Big Traverse, but here’s a hazy one just to show that it’s real. It’s not very warm today, but it is sunny and windy, so all this ice is going to have a hard time. The small patch by Scotty Island should be gone by dawn. The bigger area south of the Barrier Islands might last a day or two. I’m not sure about big sheet down on Big Traverse. It looks weak, and it’s very exposed to wind down there. It could also go in a day or two. The ice on Shoal Lake looks stronger. It might last three days or so. Sean C. will update his graph tomorrow because he’s been saying for some time that May 11 would be the day we’ll hit a thaw index of 200, enough heat to melt all the ice we made last winter. I’ll recap his method tomorrow; it worked very well this year, and shows great promise for predicting future spring thaws. May 8, 2018: Good News! I didn’t go flying today, but my co-workers at MAG Aerospace did. They had a long day, arriving home just in time to catch some pictures in the evening light. First home were John Sweeney and Andy Zabloski. Andy flew, John took pictures. Blindfold Lake shines in the foreground of this picture looking west at Bigstone Bay with Hay Island in the distance. To the left, Andrew Bay looks open, but south of the Barrier Islands looks like there’s a huge area of ice remaining. Click on these pictures to see the high resolution version that you can zoom in on. In this second shot, the plane has moved closer to Route Bay. Bigstone Bay is almost entirely open. The most ice is between Hay Island’s Needle Point and the mainland’s Heenan Point, and it’s just soft pan ice. Hay Island, Moore Bay, Bigstone Bay. More water than ice now. Scotty Island is just above the aircraft’s nose, and beyond that is the Manitou. Whiskey Island is still ice-locked, but all the ice looks soft and ready to disintegrate. Ptarmigan Bay and Clearwater look open, and I had a comment from scowtan2015 this morning to say that Clearwater’s ice blew out last night. Town Island in front of the King Air’s nose this time, and everything is open around Treaty Island, Rogers Island and Galt Island now. The next batch of pictures came from airline pilot Matthew Render, a regular guest contributor. He supplies me with pictures of Shoal Lake. Matthew took these at six o’clock this evening; the pictures look north. The first one shows the west shore of Shoal Lake: everything is clear north of Twin Points including Rice Bay, Snowshoe Bay and Indian Bay. I’m not so sure about the north shore: cloud cover makes it hard to see if there’s ice or not. Matthew’s second photo has Dominique Island in the foreground, and there’s still plenty of ice in view, but Matthew says it retreated a lot in the twelve hours between his morning flight and his evening flight today. Caroline talked to a guy from the Sioux Narrows area this morning, and he said Long Bay cleared out last night. 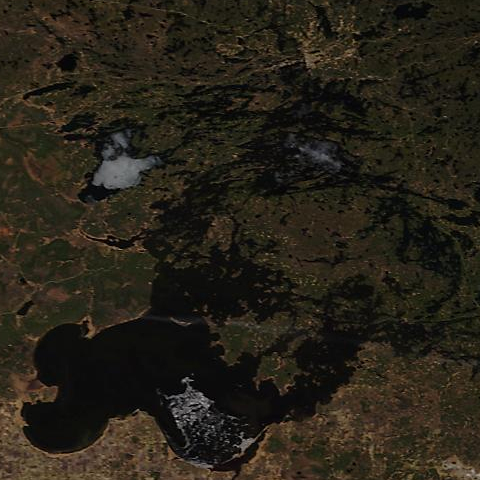 Summary: vast areas of Lake of the Woods are open now, and the remaining ice is weak and floating loose, but cloud cover blocked the satellite cameras today, so we can’t get an overview of the whole lake. More pictures are coming from my co-workers. 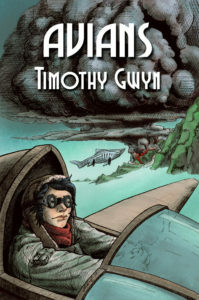 Two other MAG Aero crews landed after Andy and John did. They’ll send me pictures this evening, and if their photographs cover different areas I’ll get them up late tonight or early tomorrow morning. Thanks to everyone who pitched in to help with Ice Patrol today!